The long wait is finally over! First of all, thank you to everyone who joined my post-Mother's Day Giveaway! I had a hard time selecting the winners because your answers were all moving and deserving to win. That's why I sought help from Daddy Practicality to select the bestest of the best answers. From 15 selected, we shortlisted it to 10, then 5, then final 3. We looked for answers which were heartfelt, sincere and those that moved us. I have 3 kids, 2 of them are college student and 1 is a highschool student. The most fulfilling part of being a mother is not only about making them happy but carrying them through their learning period in life. And I am happy to share that having 2 college kids is one of the best achievements I have ever had. It made me proud because I am an instrument to fulfill my children's dreams. I made them have a good life and an assurance that in the future, they'll be successful kids with honor and right breeding that you could be proud of once you present them in the community. They have manners that I am truthfully proud of! Their education is one thing that I could give them but never could anyone steal that from them. It's a fulfilling job to lead your kids to the right path! And still am! I am proud to make 3 lives worth the wait! and I love my kids & family so much! Because Being a mother is a true vocation. It is a gift of life and is a remembrance of the miracle, we should be proud of and look back with a huge smile because this is the greatest Duty we have. We are special and extraordinary, wonderful reason and purpose why we were created. Because we are the symbol of LIFE, LOVE, SACRIFICE, FORGIVENESS, and STRENGTH. It is a 24/7 job that only GOD can give the salaries that we deserve as well as the other fringe benefits that we need. Motherhood is a journey of a lifetime it's also a mosaic we build with our child, millions of tiny moments that create LOVE. The prize i got from being a gold winner mothers is having children who are kind, god fearing, thoughtful, bright and a person who possesses all the positive virtues that God wants us to have. I am so grateful to our lord for blessing me with a son who has all those virtues and with that i am WINNER. The most fulfilling part of being a mother is being your child's first love, first kiss, first hug, personal nurse, personal bodyguard, human shield, human blanket, yaya, teacher, and caretaker. You can assume different roles. You can experience a lot of firsts. Kindly wait for an email from me on how to claim your prizes. 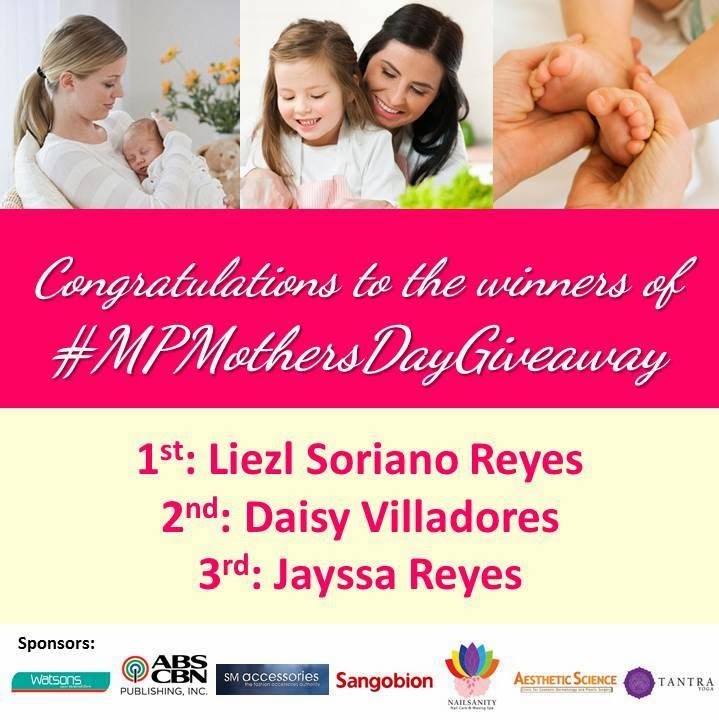 Thank you once again to all the moms who participated this special giveaway!